Amizade intern, Andrew Denny, was a part of Amizade’s first ever service-learning course in India this summer. We are so excited to hear about his experience! This is part II of his blog, to read part I click here. Greg Buie, Visions CFO, was our on-site director throughout the trip. He planned our activities every day, scheduled site visits, kept track of finances, and introduced us to the culture of Tamil Nadu. Having previously been to India on multiple occasions, Greg did an excellent job making sure everyone was comfortable in this unfamiliar setting. We were very fortunate to have someone with as much experience in the country as Greg to be our leader. As I mentioned earlier, Visions partners with other nonprofit, social advocacy organizations throughout the state of Tamil Nadu. We were given the opportunity to meet a few of these partners-Arcot Lutheran Church (ALC), SAWED Trust and SCOPE India. Both of these organizations support educational initiatives for impoverished village children. The leadership training camp took place at ALC, which houses children from India’s lowest economic caste in support of poverty relief. SCOPE India is a nonprofit which supports education and development throughout the state of Tamil Nadu. 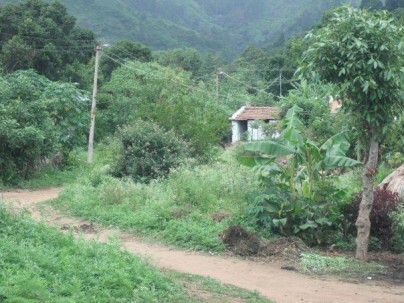 We were granted access to a couple of their partner villages. In these villages, SCOPE is working to build learning centers for the children in order to provide a higher quality education. Each organization left an impression on our group, but SAWED Trust may have provided us with the most moving experience of the trip. Led by Mr. M.S. Abdaheer, SAWED supports educational, human rights, and poverty relief initiatives for impoverished women and children. We were given the opportunity to visit one of these villages. Nestled high up in the mountains of Tamil Nadu, Abdaheer led us on an hour-and-a-half hike to the village up the winding mountains. We were happily greeted by the village people. They had set up a table for us and served their native, locally grown Jackfruit (which was absolutely delicious). We were promptly given a tour of the village along with the local schoolhouse. After saying our goodbyes and heading back down the mountain, Abdaheer took us to a boarding school under construction for these village children. 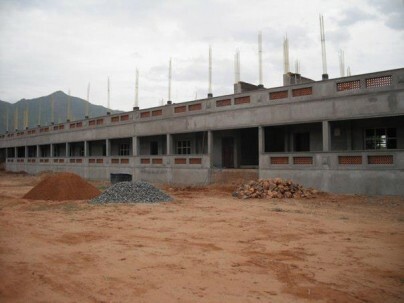 The school will be open within months and will house as many as 100 village children. This level of poverty seen in this village was extreme to the extent that access to food, healthcare, education, and other basic needs was nearly nonexistent. Life expectancy is tragically low, infant mortality rate is alarmingly high, and many of the villagers had visible health problems. Experiencing this level of poverty firsthand was such a moving experience for all of us. It’s almost a hopeless state of existence, but by providing first aid kits and by building boarding schools for these villagers, organizations like SAWED provide a glimmer of hope for these people. Seeing the improvement in facility in which these children will have access to was amazing, and I am forever moved by the experience.